On June 1, the U.S. Supreme Court issued a decision called Equal Employment Opportunity Commission v. Abercrombie & Fitch Stores, Inc. The EEOC filed this suit on behalf of Samantha Eluaf. When she was 17 years old, Ms. Eluaf applied to work at an Abercrombie Kids store in Tulsa, Oklahoma. She was called in for an interview, and thought she did quite well. When she didn’t get the job, she suspected it was because of her hijab, or headscarf, which she always wears because she is a practicing Muslim. After investigating, the EEOC found that she had been marked down in her interview for not meeting Abercrombie & Fitch’s “Look” policy. 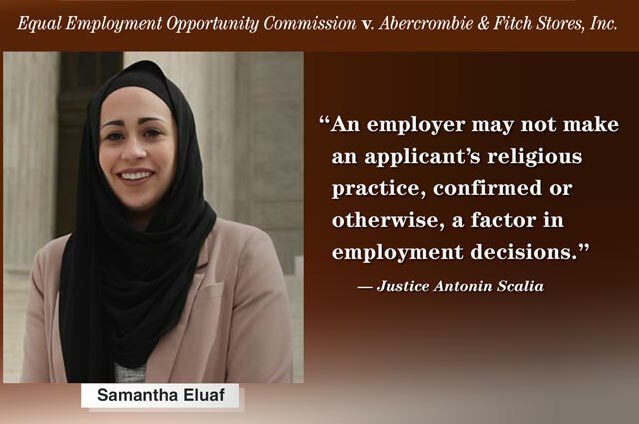 Under this policy, sales associates have to look stylish and avoid wearing what the company calls “caps.” The EEOC argued that this policy violated Samantha Eluaf’s right to freedom of religion under the First Amendment. Abercrombie & Fitch argued that their store depends on their salespeople—or “models” as they are called in the company—looking a certain way. What do you think? Did the Supreme Court make the right decision? Post your thoughts here! Originally published on Read to Know, a publication of NewsCurrents/Knowledge Unlimited. Previous Blind Dates with Einstein and Diluted Lemonade: My Five Months Without Social Media by Caroline T.